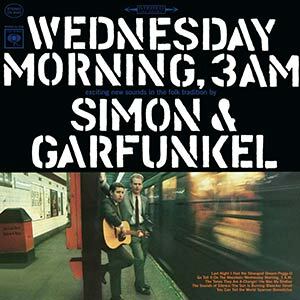 Simon & Garfunkel’s debut album was a slow burner, since they didn’t initially set the world alight with Wednesday Morning 3 am, and in fact briefly broke up to return to their respective studies. Of course, The Sound of Silence, which debuts on this album in acoustic version (and in plural form as “The Sounds of Silence”), would later change their fortunes and see their first album reappraised. In a way it’s not hard to see why Wednesday Morning 3 am didn’t set the popular music world alight immediately. Certainly, Paul Simon’s powers as a major singer-songwriter, and the harmonising he would do with Art Garfunkel are in early evidence, and the album taken as a whole is a pleasant experience. But songs such as Benedictus, in which Simon and Garfunkel harmonise vocals in Latin to a Sixteenth Century hymn, are a far cry from the outrageous adaptation of Blues music The Beatles were offering, or of the angry protest songs of Bob Dylan and others that captured the public mood. The Simon & Garfunkel sound appealed, right from their origins, to the slightly more bookish, considered, type. Their very first song, You Can Tell The World, brought black music to white audiences, but where The Beatles adapted Blues, Simon & Garfunkel chose a traditional gospel song – an odd choice, perhaps, for two Jewish lads from New York. The banjo accompaniment to Last Night I Had the Strangest Dream ties it to another American musical tradition, but there’s no obvious disconnect – already it’s clearly the vocals of the two that go together perfectly, that define their overarching sound. Bleecker Street (in Manhattan, New York) is the first glimpse of the identifiable Simon & Garfunkel sound that would captivate the world. A strong sense of place puts the listener immediately into the song, capturing perfectly a moment in time. The acoustic approach is deceptively simple, but Bleecker Street is haunting and powerful. The next song, Sparrow, establishes one of Simon’s favourite themes – nature and the cycle of life. The imagery is powerful, and the last verse amongst Simon’s most profound. The theme is returned to later with The Sun is Burning. If the previous two songs establish Simon & Garfunkel’s familiar stylistic and thematic territory, then The Sounds of Silence is the first glimpse of one of their all-time classic songs. This version is much less well-known than the later, more heavily-produced single, but hearing it stripped down to the acoustic essentials gives it a purer sound that invites closer attention to the poetic lyrics. The second side opens with another strong song. He Was My Brother is a tribute Paul Simon wrote to a friend and peer who had died young under tragic circumstances, but there’s also a maturity of understanding often missing from protest songs. The personal nature of it make it a stronger entry than the traditional songs Peggy-O and Go Tell It On The Mountain. The penultimate song, The Times They Are a-Changin, is so firmly established as a Bob Dylan classic that a cover version adds little other than to signal Simon’s influences. The final song is the title track. Wednesday Morning 3 am is a romantic song with a sinister twist – an idea that was later revisited more dramatically. But here, it’s a down-key ending to a debut that has its strengths and weaknesses. Overall, Simon & Garfunkel were better when Paul Simon wrote his own songs, and as time went on, his confidence and ability grew, and the original songs became stronger. It meant that better things were to come, as the acoustic version of The Sounds of Silence signals. Nevertheless, the songs are beautifully sung, and the stripped-back production gives it a certain purity. Wednesday Morning 3 am is the start of something special. Revisiting the genesis of one of the most important musical pairings on vinyl and in stereo is a pleasure indeed.